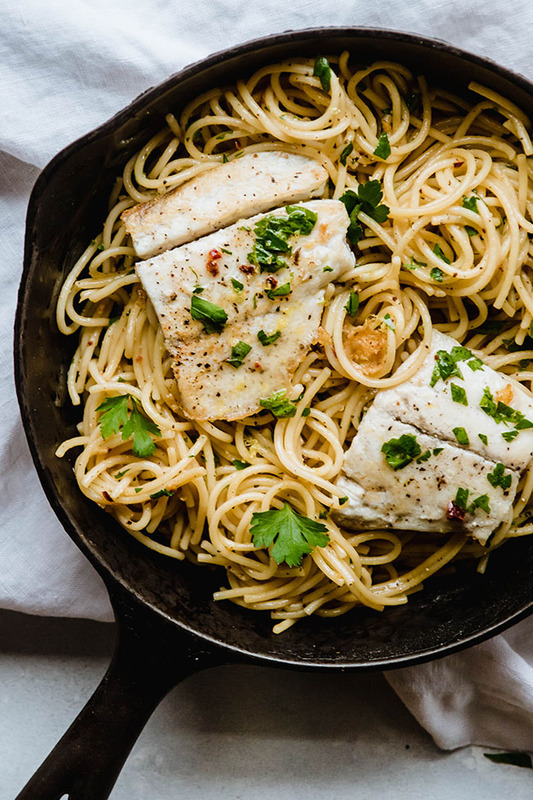 This easy barramundi lemon garlic pasta is ready in 30 minutes – perfect for busy weeknights! This post is sponsored by my friends at Australis Barramundi. Lemon garlic pasta! With barramundi! That’s ready in half an hour or less! It’s gonna be a good day, friends. We’re working with my favorite hearty, freezer-friendly barramundi again today, because 1) It’s delicious and 2) I almost ALWAYS have a bag of this in the freezer, so it’s perfect for tasty dinners when you haven’t made it to the store and 3) my friends at Australis Barramundi work exceptionally hard to raise and harvest these fish in an environmentally- and socially-conscious way. This was the first ocean-farmed fish to receive a Best Choice rating from Monterey Bay’s Seafood Watch program, and Australis also works with a variety of industry stakeholders to make the fish farming industry as a whole better for the fish, the environment, the workers, and the consumers. PS – You can read more about why I love barramundi in this post and listen to me interview the Australis CEO on At The Table Podcast here! So basically, we’re making a tasty, quick, easy dinner with a side of all the feels. 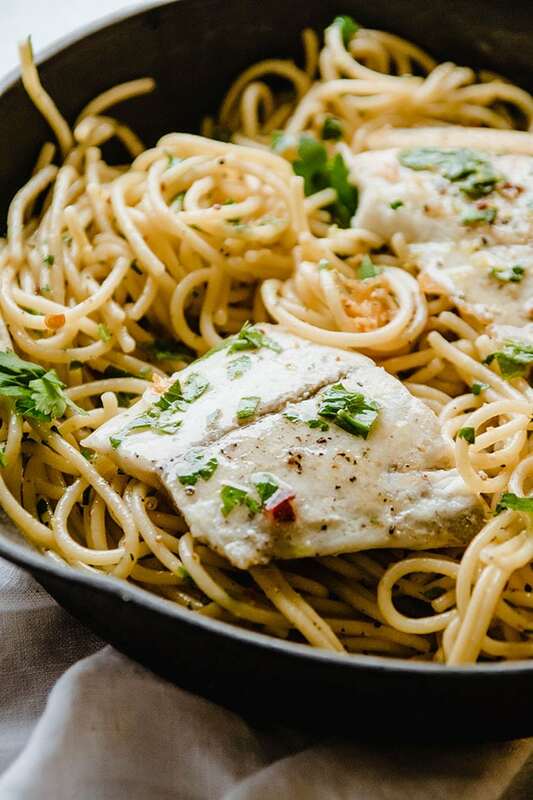 This lemon garlic pasta recipe is suuuuuuper simple and very forgiving – use what you have on hand and don’t be afraid to tweak things around to suit your tastes! 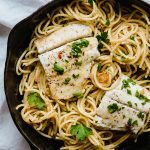 A quick and easy lemon garlic pasta with barramundi! 2 defrosted Australis Barramundi fillets (about 12 oz). When pasta is al dente, reserve 1/2 cup of the pasta water. 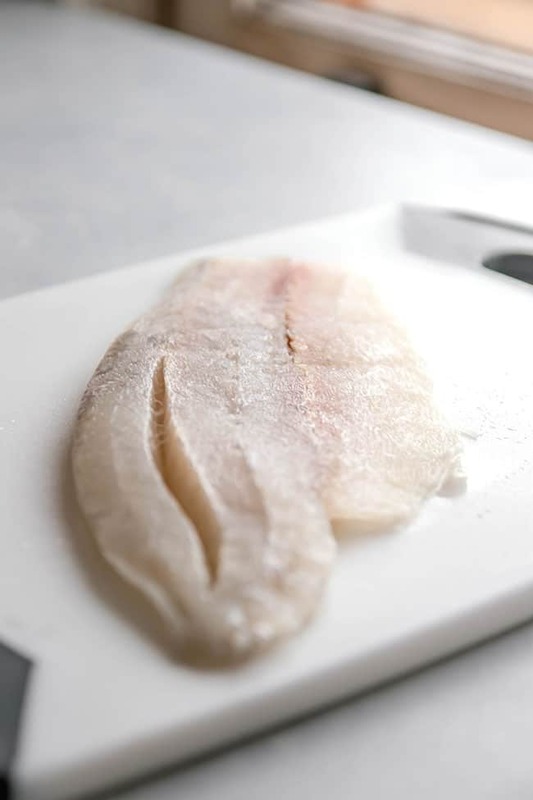 Pat barramundi fillets with a paper towel to remove any excess moisture. This will help prevent sticking. If you like, cut barramundi into portions. I like to cut my fillets in half so they fit in my skillet more easily. Lightly season both sides of the fish with salt and pepper. In a large nonstick or cast iron skillet, heat vegetable oil over medium-high heat. 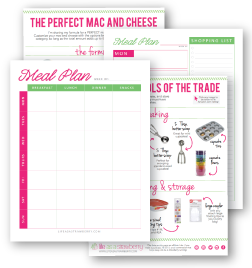 Give it a few minutes to heat up – you want a HOT pan here to help prevent the fish from sticking! 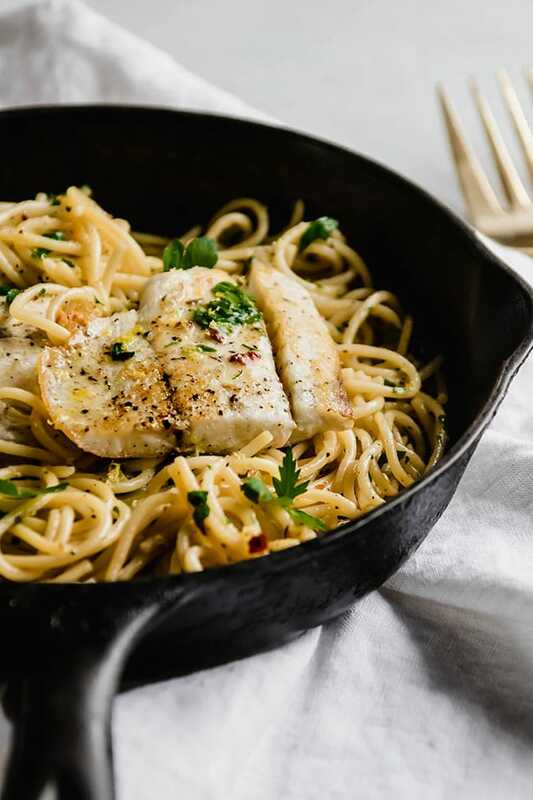 When the skillet is hot, carefully place barramundi pieces in the pan. You should hear a nice sizzle! Cook barramundi for about 2 minutes until the edges have begun to turn opaque. Carefully flip with a thin spatula and cook for two minutes more or until cooked through. 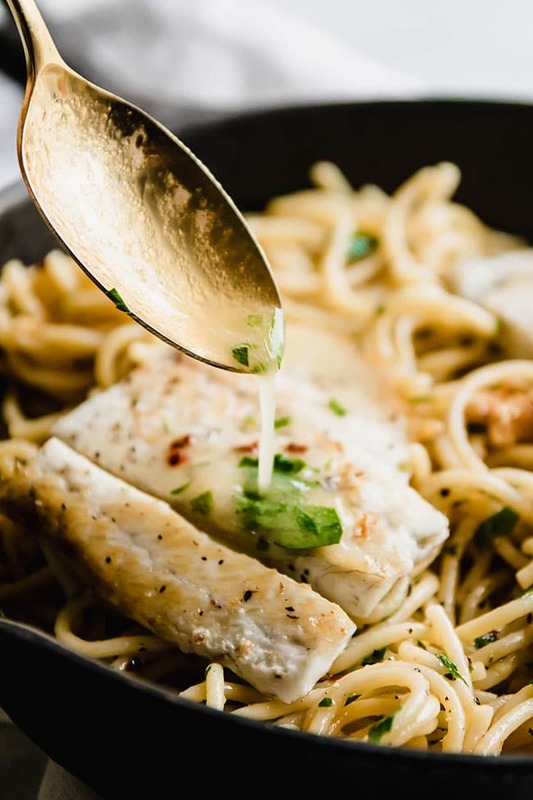 Remove cooked barramundi to a plate and return the skillet to the burner over LOW heat – the pan is still hot, and you don’t want to burn anything while you finish the sauce! Add butter, garlic, and red pepper flakes to the skillet, keeping the heat on low. Stir frequently – the skillet will still be hot, and you don’t want the garlic to burn. I like to stir until butter has melted and garlic is fragrant and slightly softened, about 1 minute. Add the juice and the zest of one lemon to skillet and stir to combine. Add chopped parsley to skillet and stir to combine. Reserve 2-3 tablespoons of sauce to drizzle over the barramundi. Add cooked pasta to remaining sauce and toss to combine. If it looks dry, add a splash of pasta water to bring it together (I generally use about 1/4 cup of pasta water). 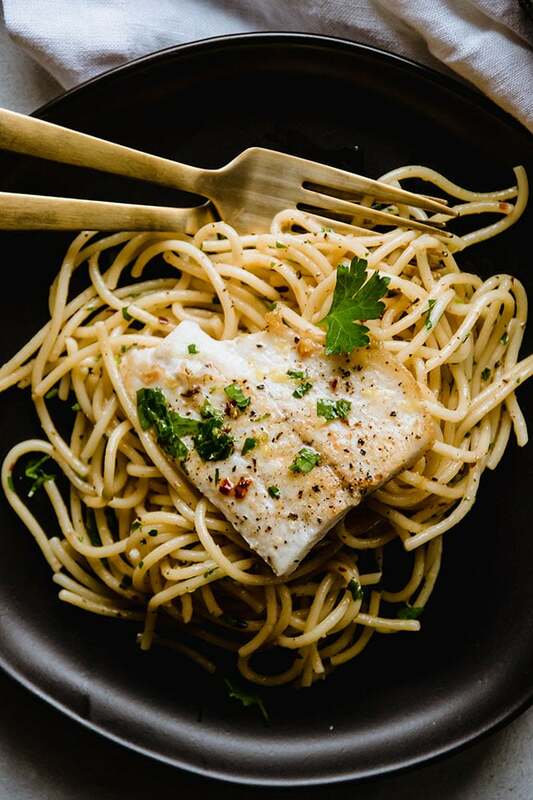 Top spaghetti with cooked barramundi and drizzle the fish with the sauce you reserved earlier. Garnish with fresh parsley and serve immediately. I cut my barramundi fillets in half to create smaller portion sizes that fit more easily into my skillet. Leave the fillets whole if you like, or cut them into smaller pieces. This is a great blank-canvas pasta: add basil, spinach, kale, more garlic, or any other veggies you have for a heartier meal! Use zucchini noodles in place of some or all of the spaghetti to lighten up this lemon garlic pasta even more. Use more or less butter or lemon depending on your personal preferences. I like a bold lemon flavor, but you can use less lemon juice and zest if you prefer something more mellow. Don’t be afraid of seasoning! Because this pasta is so simple, it’s especially important to season with salt and pepper to help the flavors shine. I recommend good Kosher salt and fresh ground pepper. I use vegetable oil here because it has a high smoke point and doesn’t impart much flavor. Clarified butter and canola oil also work well. You can use butter or olive oil in a pinch, but they may smoke or burn and impart more flavor than you want here. Thanks for sharing your experience in cooking by using pasta. This recipe help others and me to cook any style by applying pasta.